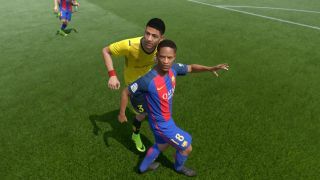 Until now FIFA 18 developer EA Canada has been tight-lipped on exactly which clubs, and leagues, will form the storyline behind Alex Hunter's return in season two of The Journey – but one sneaky Redditor claims to have solved the mystery. A leaked screen posted by user Oskarek, purporting to be from a Brazilian event showcasing the game, appears to show six selectable countries within the mode. They are Brazil, England, USA, Germany, France, and Spain. However, Brazilian club players weren't in last years game, so its intriguing that that nation is represented by its flag in the leaked screen, rather than a league or club logo. A poster named Rodhas offers an explanation for that: "I was at this event today and they specifically mentioned that the Brazil part is just for the pre-season. No Brazilian league confirmed yet." One thing I should point out, and reported back in June, is that The Journey is split into six chapters. Could each of these represent one chapter? It's an explanation which would tally with that Rodhas quote, with the mode likely kicking off with a Brazil friendly before moving back to the Premier League for chapter two. As soon I have any official word from EA, I'll pass it on. Still playing FIFA 17? Be sure to check out this piece on the FIFA 17 Ultimate Team card it took me seven years to save up for.